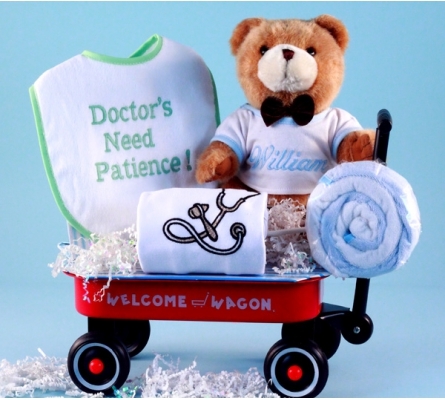 Our trademarked Welcome Wagon Baby Gifts offer an ideal combination of visually exciting presentations, great components, plus spot on sentiment to "welcome" a new baby. 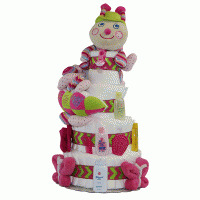 Is it any wonder that Welcome Wagon baby gifts consistently rank among our best sellers year after year? 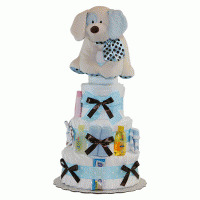 Available for a boy, girl, twins, triplets, and in neutral as a baby shower gift. Personalized versions and deluxe versions are also available. 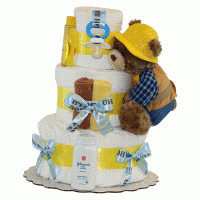 Whichever one you choose, you can feel confident knowing that a Welcome Wagon™ makes a classic baby gift. Doctor's may deliver babies but when a doctor has one of their own "Patience" not "Patients" is the thing they'll need most! 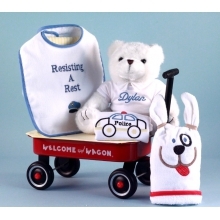 If there's a doctor on your baby gift list, then what could be cuter or more approriate than this Welcome Wagon baby gift filled with doctor themed layette items, including a beautiful 10" plush bear wearing a t-shirt personalized with the future doctor's name. Doctor's Need Patience is also available as a baby girl gift.